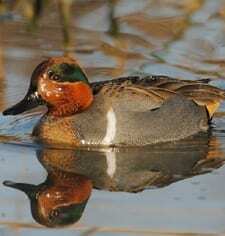 The little Green-winged Teal is the smallest dabbling duck in North America. The natty male has a cinnamon-colored head with a gleaming green crescent that extends from the eye to the back of the head. In flight, both sexes flash deep-green wing patches (specula). Look for them on shallow ponds and in flooded fields, and listen for the male’s decidedly non-ducklike whistle. These common ducks breed along northern rivers; wintering flocks can number as many as 50,000.